Purex is the brand of detergent that we use most in our house. It is a name that I have come to rely on to the point that, when I go shopping, I don't even realize that there are other options at the store. Recently, I was given the chance to do a review on the newest member of the Purex line of detergents, Purex Baby Detergent. I know it may seem a little odd for me to do a review on baby detergent as there is no baby in the house at the moment. I do however have two kids ages 5 and 8. Both of my kids have super sensitive skin, just like me. I have always had to watch what detergent, soaps, and softeners that I use. A wrong decision at the checkout counter can end up in irritation or skin rash. 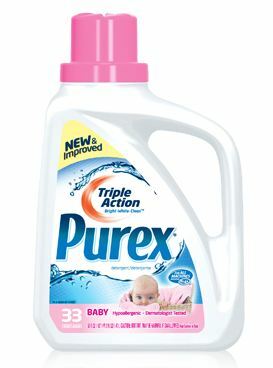 Purex detergent has always been perfect for our skin, the baby detergent is no exception to that. My husband and I are planning on having another little bundle of joy soon, so this is a great opportunity for me to try this new product ahead of time. For my review I was sent a full size bottle of Purex Baby. I have to say that the bottle and pink lid is the perfect look for a baby detergent bottle. This is the bottle of detergent that stands out easily in the store when you are shopping for baby detergent. The detergent offers the Triple Action Formula that we have all come to trust. Which I have found to be great with stains and would-be stains. This lets me know that it will do the job on baby clothes when it comes to baby food, spit ups, and of course the dreadful formula that I think accounts for most staining on babies clothes. I have to say that if this detergent can get the stains out of clothes that my two kids put into them this is going to work like a breeze with baby stains. There are several things that the detergent offers that I love. This formula is gentle enough for baby skin and also clothing. It offers the Triple Action Formula. There are no dyes, making the detergent clear. Which makes it perfect for sensitive skin. Plus, if you have a HE washer this detergent works great in it just like regular washers. The one thing that I have not mentioned is the smell. It smells so good, makes me remember when my kids were little. It is simple and pleasant. My kids clothes have come out smelling so good, clean, and fresh looking. I now know what detergent we will be using when we have our next little bundle of joy. About the company: The Purex brand was founded in Los Angeles, California in 1922 and, for 88 years, has been known as the laundry brand that consumers trust to provide the most value for the money. Over the years, the company has grown from a single product—liquid chlorine bleach sold in amber pint jars—to the almost two dozen laundry products sold under the Purex brand name today. Moreover, along the way, Purex has been a leader in sustainability and developing eco-friendly products. Where to purchase: You do want to check to see where you can purchase this product. Not all stores carry this product yet on their shelves. You can check out the store locator on the Purex website. You are currently able to purchase this in a 50 oz bottle but the 100 oz bottle is coming soon. Thanks for the post and the giveaway opportunity. This would be great as my daughter is due any day for her second baby.